A Follow Spot: Teasing Season 3 of "Downton Abbey"
The PBS site is offering some tempting hints about what's to come, and some snippets of video have been out and about on various media sites. Yes, Matthew and Lady Mary are still planning to wed, and yes, Sybil is still married to her socialist chauffeur and expecting a baby. Poor Bates has been convicted of offing his horrible wife, but at least he isn't sentenced to death anymore, and his true love, Anna, is staying on at Downton Abbey now that Mary called off her plans to go to America to get away from her nasty fiance, Richard. Expect plenty of challenges for all of those relationships as "Downton Abbey" moves into the post-World War I period and political, social and economic strife ramp up. Think about it — the Jazz Age, Hemingway and Hitler are on the horizon. But the biggest change afoot at the moment for the Crawley family is that American Grandma is coming to town. Shirley MacLaine has joined the cast (she's in the picture above, next to Dame Maggie Smith as Violet, the Dowager Countess) as the American mother of Cora, the Countess of Grantham, who is played by Elizabeth McGovern. MacLaine's Martha Levinson arrives and immediately clashes with Smith's Dowager Countess, showcasing class and culture conflicts between the aristocratic values of the British empire, represented by Violet, and brash, new American ways, represented by Martha. That's front and center in the video you can see here. "You Americans never understand the importance of tradition," snipes the Dowager Countess as an opening salvo. "Yes, we do," replies the unimpressed Mrs. Levinson. "We just don't give it power over us. Maybe you should think about letting go of its hand." 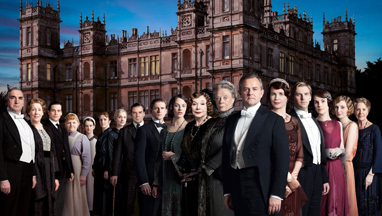 PBS offers this "tantalizing glimpse ahead," telling us that "Downton's impeccable butler, Carson (Carter), breaks in a new footman, who happens to be the nephew of the scheming lady's maid O'Brien (Siobhan Finneran). Following Matthew and Mary's engagement, Robert sticks to his duty to maintain Downton more firmly than ever — even as other great houses are crippled psychologically and financially in the wake of World War I." Sounds exciting, yes? I'm not sure I can wait for January. But I guess I'll try. Indeed, I picked up the PBS site's styling. It's fixed! Oh, and meanwhile, I wasn't sure if Shirley MacLaine's character is really a Mrs. but I figured it was fairly safe. She's certainly not a Ms. at this juncture.